The Finnish cellist Anssi Karttunen performs these volatile and fugitive pieces (Sept papillons) with grace and clarity. (...) The Los Angeles Philharmonic manages in an enchanting way to make audible what constitutes the basic components of Saariaho's elegant construction of colour and sound: finding the balance through extremes in articulation, phrasing and sound, as well as artfully delicate transition. (...) This CD proves that contemporary music is not necessarily austere or ethereal, but can present itself in a very approachable and sensual way. (...) The entire production is a splendid and entirely successful example of contemporary sound magic. 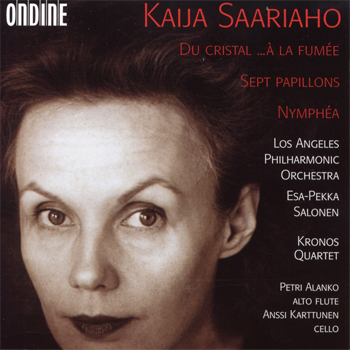 This CD features four works by Finnish composer Kaija Saariaho: Sept papillons is combined with three previously released recordings (ODE 804-2, 1992) of Du cristal, ...à la fumée and Nymphéa.